The holy grail of a food blogger is to find and write about that one undiscovered restaurant about which no one else has ever written. It will have such great food and atmosphere that once your ground-breaking blog post is made public, you will forever be honored and revered for your culinary-investigative abilities. Yeah, right. Problem is, there are very, very few restaurants in Houston that have not been written about. But my curiosity implores me to forge ahead. One way I track down unknown restaurants is simple: I ask people. So a couple of weeks ago at the Greek Festival, in between scarfing down spinakopitas and sipping overpriced and complexity-challenged Greek wine, Alley Cat and I chatted up a couple of nice fellows standing at the same table. Turns out they worked at the Mexican consulate here in Houston. After the obligatory musings about politics, I rolled out my usual query to someone who might know a good “ethnic” restaurant: If your family from Mexico came to visit you in Houston and after a week of BBQ and chicken fried steak and buffalo wings they were craving an authentic Mexican dinner just like they would get at home, where would you take them in Houston? My question was answered with another question. “Which family from which part of Mexico? There are many different areas of Mexico and many corresponding cuisines,” they asserted, eyes widening and voices deepening. This was getting interesting. I think my mouth started watering. Could I be on the verge of an unknown find? Read on to find out. After a nightcap of beer and football at Griff’s, I stumbled home and did the Google. “Mexico’s Deli.” The usual Citysearch and Yelp results. Then there it was: a review of Mexico’s Deli by the indefatigable Robb Walsh at the Houston Press. Bloody hell! That guy’s been everywhere and reviewed everything in freakin’ Houston. My dreams of food blogging fame dashed, the next day I pulled on to the brand-spanking-new Katy Freeway and charged west to this highly recommended, Mexico City-inspired emporium for tacos and tortas. 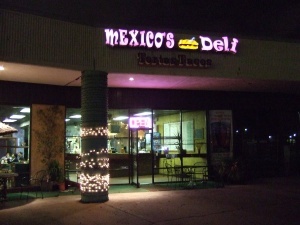 Mexico’s Deli offers tortas and tacos using meat cooked on and cut from a “trompo,” or vertical spit, Mexico City-style. Similar to the vertical roasters you see at Greek and Mediterranean restaurants, the meat here is actually pre-cooked due to Houston health codes. For details on the preparation, see Robb Walsh’s article above and an in-depth report here. My first dish was pambazo, a torta with chorizo, potatoes, sour cream, cheese and lettuce. 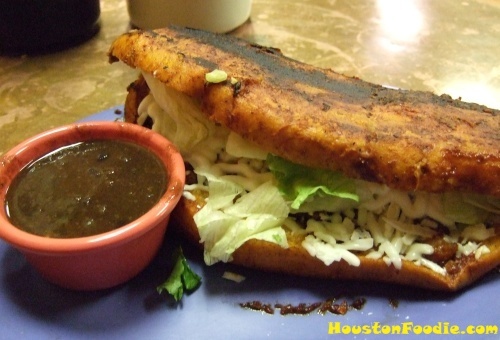 The bread is soaked in a Guajillo chile sauce and toasted. On my first bite I discovered the chorizo pork nuggets were inedible chunks of rubbery gristle. Seriously. INEDIBLE. 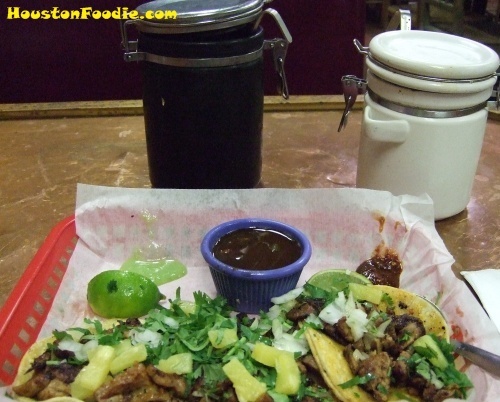 WHY CAN’T I GET TENDER, GRISTLE-FREE SLICES OF PORK OR BEEF AT MEXICAN RESTAURANTS ANYMORE? ARRRGH! Maybe due to higher costs restaurants are buying crappier cuts of meat? Maybe it’s the supplier cutting corners? I just don’t know, but it’s killing me. Eating the sandwich usually involved the following process: take a bite, chew a couple of times, locate the rubbery nuggets, and then spit them out, machine-gun-like, into a discreetly placed napkin. It was like eating a watermelon and spitting out the seeds. The good news is that once you got rid of the gristle nuggets, the sandwich was spectacular. The soft, toasted, smoky, peppery, drippy bread was fabuloso. This included a triumvirate of multi-layered corn tortillas piled high with roasted pork, fresh cilantro, onions and pineapples with jugs of green (tomatillo/avocado) and red sauce (something really hot) on the side. Oh dear lord this was a wonderful dish. How often do you find anything this authentic inside the loop? A pile of cilantro and pineapples? Most Americans wouldn’t go near it. But it was oh so good. Even the pork, still a bit chewy in places, helped make this dish great. 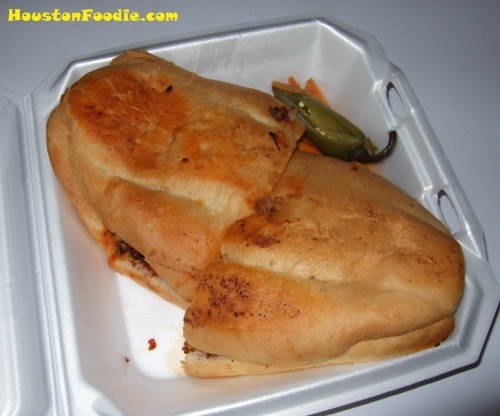 On my last visit, having never tried a torta there, I ordered one to go. This ginormous Mexican sandwich contained chorizo (still gristly, but a bit less so from the previous visit), cheese and mushrooms. Giving off an overwhelming fragrance and flavor of cumin, this is a sandwich that would most likely have to be “Americanized” (i.e. tone down the cumin and other spices) to work in a conventional Mex-Mex or Tex-Mex restaurant. Counter-service. Friendly, efficient. Seat yourself. Once prepared, your food is brought out to you along with the jugs of green and red sauce. Although Mexico’s Deli may transplant authentic Mexican food to Houston, it’s location and surroundings do not inspire visions of bustling market stalls in Mexico City. Rather, it sits in the most non-descript of strip centers on S. Dairy Ashford. At night, it’s the only store open in the center. But it is strangely welcoming, this oasis of light on a darkened strip of boulevard in Houston’s exurbs. The first time I visited, late in the evening, the store was brightly lit but completely empty. Normally not a good sign, but as I settled in there was a steady stream of Mexican-Americans (very good sign for a Mexican restaurant) ordering take-away at the counter. I can safely say that I was the only gringo there for the duration of my visit. Unfortunately the restroom, though not completely squalid, left much to be desired. Not quite bad enough to be a deal breaker for me, but the floor was wet and littered with toilet paper, the toilet wouldn’t flush completely (both visits) and the dispenser was out of soap. 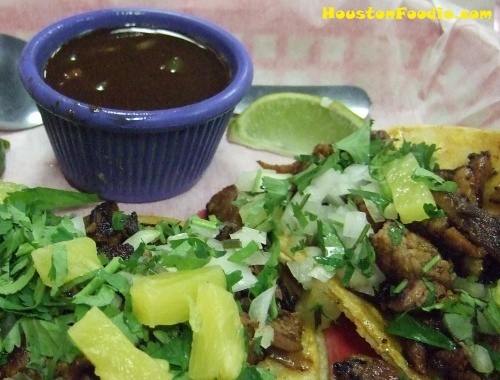 The tacos al pastor at $4 is one of the single best food deals in all of Houston. The prodigious tortas, half of which would make a meal and the other half good for the next day, are also a great value at $6-$7. I really like Mexico’s Deli. If just for the uniqueness of the dishes and flavors. It is true that the food at Mexico’s Deli has not been “Americanized.” Eating and savoring the tacos al pastor, ladling on generous pools of red and green sauce, smelling the roasted pork and fresh corn tortillas and cilantro — you do feel like you’re in a different place. Now if they can consistently serve up good quality meat and keep their bathrooms clean, I might be tempted to trek out to S. Dairy Ashford on a regular basis. This entry was posted in Blog Only, Food, International Cuisine, Restaurant Reviews and tagged al pastor, griff's, mexico's deli, robb walsh, trompo. Bookmark the permalink. I tried this place based on Walsh’s review. The tortas are huge but I wanted a less overwhelming spices on my food. Also, maybe you should try Tacos del Julio on Hwy.6 and Bellaire. Wednesdays, for $9.99, you can eat all the tacos you want from either the trompo or bistec.